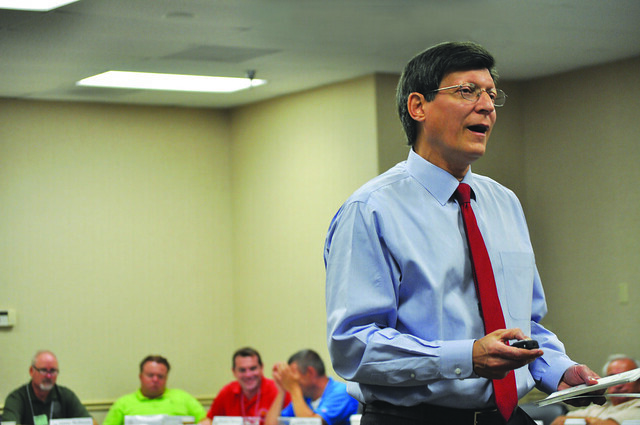 The Insulators hosted 37 recently elected union leaders to a week-long event to help them carry out their duties as union officers. The 2016 New Officers Training Program was held in September in the Conference Center at the Maritime Institute in Maryland. Started in 2005, the training program is designed to educate the newly elected officers on all the various duties and responsibilities and help them serve to the best of their ability. Topics included LMRDA, jurisdiction and International agreements, political affairs, grievance filing procedures, fiduciary and trust responsibilities, organizing, apprenticeship, Roberts Rules of Order, and other pertinent items that our local union officers need to know. Besides the new officers, a number of International officers participated in the training, including Jurisdictional Director John Conroy, Organizing Director Todd Dunnahoe, Political Affairs Director Chip Gardiner, IIIATF Administrator Tom Haun and General Secretary-Treasurer Greg Revard. The new officers are to be congratulated for completing their training. The following attended the program: Gerald McAtee III, Local 1 St. Louis; James Cassidy, Local 2 Pittsburgh; Timothy McManus, Local 2 Pittsburgh; Patrick Corrigan, Local 3 Cleveland; James Lister, Local 6 Boston; Doug Steinmetzer, Local 7 Seattle; Todd Mitchell, Local 7 Seattle; Jeramy McCoy, Local 10 Little Rock; DustPruitt, Local 10 Little Rock; Jeffery Toliver, Local 13 Jacksonville; Kevin Lindsey, Local 17 Chicago; James McManus, Local 17 Chicago; Kimberly Patrick, Local 18 Indianapolis; Paul Watson, Local 22 Houston; Domingo Barron, Local 22 Houston; Gerald Werle, Local 25 Detroit; Steven Carr, Local 37 Evansville; Scott Kraus, Local 37 Evansville; Timothy Urwin, Local 39 Omaha; Joshua Meehan, Local 41 Fort Wayne; Christopher Sowden, Local 42 Wilmington; Patrick Welch, Local 47 Grand Rapids; Howard Clark, Local 47 Grand Rapids; Durward Fleming, Local 55 Mobile; John Hanson, Local 64 Tulsa. ; Andrew Miller, Local 75 South Bend; Jonathan Humphreys, Local 80 Charleston; Ronald Piersol, Local 80 Charleston; Sean Nagle, Local 81 Cedar Rapids; Sonny Sandretto, Local 82 Spokane; Chester Gesemyer, Local 89 Trenton; Thomas LeCount, Local 91 White Plains; William Timmons, Local 91 White Plains; William Dill, Local 92 Columbia; Daniel Hunnicutt, Local 96 Savannah; Patrick Sullivan, Local 110 Edmonton; and Garrett Gronick, Local 118 Vancouver.